Robert Juliat's Solo and Quadri dimmable fluorescents offer a unique system – with no equivalent on the market – of smooth dimming from 0% to 100%. Enhanced by the outstanding 7,500-step smoothing function of the Digitour fluo dimmer pack, there is no flicker or unsightly cut out, even at low levels. This makes them popular in the demanding environments of opera house and studio and are equally at home as auditorium and foyer lighting. 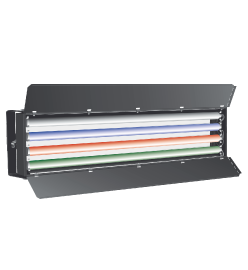 Robert Juliat fluolights provide the answer, in both subtle and dramatic form, to cyclorama lighting, concealed scenery lighting and proscenium highlights, in addition to the traditional use as specials and practicals.